The list of new tenure-line professors includes former NASA scientists, novelists, and a Rhodes Scholar. 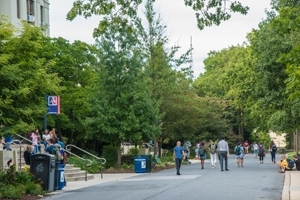 American University has hired 31 new tenure-line faculty this academic season across a variety of schools and departments. Here is a look at the new scholars to join AU, a list that includes former NASA scientists, novelists, and a Rhodes Scholar. Researching criminology issues can require painstaking analysis. But Kareem Jordan, a new associate professor in AU's School of Public Affairs, has never been content to stay behind his desk. Jordan values engaging with his community, mentoring young inmates inside jails and working with programs such as Big Brothers Big Sisters of America. "I think the purpose of research is to inform practice," says Jordan, who specializes in juvenile justice and race. "I believe in bridging that gap between academia and practice." Jordan is in a strong position to mentor young people in vulnerable communities, because he grew up with similar obstacles in North Philadelphia. "I had every risk factor. Single-parent home. Poor area. Schools are horrible, friends who are involved in some not-so-good things. And I turned out pretty well," he says. "So, I'd like to be able to give back." During Jordan's formative years, his mother battled with the Philadelphia school district for him and his sister to be bused to a better school. He eventually attended Northeast High School-far from perfect, but with enough resources to help him get to college. He started out at Temple University and did well academically. Yet so close to home, it felt too much like high school, so he transferred farther west to Indiana University of Pennsylvania. At first, like many students, he had a little too much fun. "After I got put on academic probation, that was enough to get me in gear, and I came back and ended up graduating with honors," he recalls. Jordan was earning a master's degree at IUP, with an initial plan to attend law school. But after he thoroughly enjoyed teaching a guest lecture, he changed his career trajectory. He subsequently got his PhD in criminology from IUP and became a professor. He's taught at University of North Florida, University of Central Florida, and most recently, University of Massachusetts Lowell. He's written extensively on the consequences of moving juvenile offenders into the adult criminal justice system. In 2016, he co-authored the book, Race and Ethnicity in the Juvenile Justice System. Upon talking with his wife, they decided this was a good time to look for a new position. When he saw an opportunity at AU, the school-and the larger D.C. community-seemed like a perfect fit. "To me, it was a no-brainer," he says. "And when I interviewed, it just reinforced all of my great thoughts about the program and SPA." For the past seven years, Stefanie Onder earned invaluable experience working for the World Bank. She conducted field work in East and South Asia, and has seen firsthand the complexity of implementing development and environmental projects. But after spending years caught up in day-to-day tasks, Onder was ready to take a step back and focus on the bigger picture. An academic position allows her more opportunity to contemplate the work. "When you manage projects, you don't really have the time to think about the causes and challenges," says Onder, a new assistant professor in the School of International Service. "I eventually decided it's time for a shift in gears, to move back into academia to really start thinking about these issues in more detail." But her work can also inform her scholarship. For instance, she learned the hard tradeoffs between economic development and environmental protection. "For one program that aimed to reduce emissions from deforestation, we went to an absolutely impoverished remote village in Fiji. You go to a village that doesn't even have electricity or running water or toilets, and you tell them they have to protect their trees, as opposed to planting crops there," she recalls. "You really come face to face with those kinds of dilemmas." Her time at the World Bank also reinforced the need for solid empirical evidence to support new policies. "When you work on sustainability issues, there's a lot of passion just for the environment itself. But that does not fly easily with a minister of finance, who looks at the budget," she says. "So how can you make an economic argument for why it makes sense to protect your environment?" Onder and colleagues examined a Manila-area lake, where 90 percent of the sewage flowed in unfiltered. Fixing the problem would be expensive, but if the sewage kept running unabated, most of the lake's fish would die. That, in turn, would affect jobs and nutritional intake. "It gets to the point where you say, 'This many livelihoods depend on this lake,'" she explains. Onder grew up in Munich, Germany. She went to the UK to get her undergraduate degree at University College London. She later earned her master's and PhD in economics from the London School of Economics and Political Science. She remains passionate about finding the balance between sustainability and economic progress. "I want to help empower people to take charge of their own lives," Onder says. "But, at the same time, do that without destroying the one planet we have." For people of color in the media, Sherri Williams believes in the power of positive representation. She addressed the issue in her dissertation, evaluating social media reactions to television. She analyzed Black Twitter responses to reality TV, a genre that tends to caste a "type" rather than a nuanced, developed character. "When it comes to reality show casting for black women, and women of color across the board, there are these racialized and gendered stereotypes: the fiery Latina; the angry black woman," she says. "My whole dissertation was about if we see these stereotypes on reality television, and people tweet about them a lot, then do these stereotypes end up getting amplified in popular culture?" Williams will explore her research passions as assistant professor in race, media, and communication at AU's School of Communication. Taking this new job, she appreciated that SOC supported her focus on race and media. "[SOC] showed me that there is a commitment to that kind of study, and a respect for that kind of work," she says. Growing up in southwestern Michigan, Williams always felt the influence of popular culture. She was a fan of talk show host Phil Donahue, who facilitated thoughtful, socially conscious discourse on a variety of topics. And seeing an African-American woman like Oprah Winfrey on TV was a revelation. "She was big and shapely, and she looked like the women in my family. And that really sparked my interest in telling those stories that I didn't see in the media." Also a voracious reader of magazines like Ebony, Jet, Newsweek, and Time, she planned to tell real, untold stories through journalism. In high school, she sometimes felt marginalized being the only black kid in class. And when choosing a college, another pop culture inspiration intervened. A Different World, a Cosby Show spinoff, was a groundbreaking TV sitcom about a fictional historically black college. After seeing the show, she wanted to attend an HBCU, and she earned her undergraduate degree from Jackson State University. Williams had a successful career in journalism, working for the Associated Press, The Clarion-Ledger (Miss. ), and The Columbus Dispatch, and she still freelances for national media outlets. With a desire to learn multimedia journalism, she returned to school to earn a master's degree at Syracuse University. Spurred by a professor impressed with her academic work, she eventually earned her doctorate there in 2015. With everything else she's accomplished, she's also been a part-time singer. Williams previously performed in both a blues band and a Brazilian jazz band, and she'll drop the occasional music reference in class. Jessica Leight always wanted to see the world. That desire to travel inspired her to pursue her chosen field, development economics, and led to a scholarly fascination with China. Leight, a new assistant economics professor in the College of Arts and Sciences, still researches the economy and export practices of the world's most populous nation. "The literature on the Chinese economy is really growing rapidly, especially as we have more and more Chinese students and Chinese scholars here in the U.S. But I still think that there's a lot more scope for work," she says. Born in New York City, Leight grew up in Connecticut and Cambridge, Massachusetts, before attending Yale University. She studied Mandarin Chinese there, partly because it was a country she envisioned visiting. Then, a dream opportunity came along when she applied to be a Rhodes Scholar at the University of Oxford. "I did an interview, and then sent in this packet. The fact that we needed eight copies really surprised me at the time, because they don't like to do their own photocopying," she jokes now. She lived in China before starting her Rhodes scholarship. While earning her Oxford MPhil in economics, she traveled to other parts of Europe and Sub-Saharan Africa. Upon returning to the US, she enrolled in a PhD program closer to home, at Massachusetts Institute of Technology in Cambridge, Massachusetts. She wrote one research paper on how Chinese parents choose to allocate resources between children (despite the one-child policy, many rural Chinese families have multiple kids). "What I found is that the child born in the bad harvest year seems to get more support. So, there's this compensation," she says. Leight recently taught at Williams College in Massachusetts. She focuses on structural transformation-how nations transform from agricultural to industrialized-and AU's proximity to places like the World Bank was too good to pass up. She's already found AU students lively and motivated. As an ice breaker at the start of her classes, she asks students to pick their favorite book, movie, or TV show from the previous summer. "Sometimes it's a TV show I also like, and we can talk about it for the rest of the semester," she says. "It's a good way to get to know people." Sophisticated academic research can develop from simple human interactions. If a mentor is too strict with a student, it might have a negative impact. But if the mentor is too lenient, the student may lack discipline and underachieve. As Kogod assistant professor of finance and real estate Ioannis Spyridopoulos explains, the parent-child relationship similarly requires finding the right mix of rule-making and flexibility. Taking this a step further, Spyridopoulos applies the relationship to banks and financial firms. "Banks want firms to do well, because if firms do well they pay their loans and everybody's happy," he says. Yet banks also write contracts with requirements for those firms. "How strict do you make those contracts? If you make them too strict, you end up hurting the firm. If you make them too loose, you end up letting managers pursue their own interests." Spyridopoulos says these kinds of relationships affect the entire economy. He took interest in this subject matter while observing his home country of Greece suffer through a financial crisis. "As the country was trying to get bailout loans from its creditors, the restrictions that the creditors were imposing on the country were things that they should have done years back," he notes. "So why wouldn't the country try to do those things to begin with? The answer to that is poor governance. And the same thing happens with corrupt managers, who pursue their own agenda instead of what's best for the firm." Spyridopoulos grew up in Athens before coming to the U.S. to earn his master's degree at Duke University. Just this spring, he finished his PhD in finance at Rice University. Along the way, he spent a year studying at the University of Chicago Booth School of Business, and he returned to Greece to do a mandatory year of military service. He recently had his first child, so his research notion of balancing discipline and flexibility will be put to a practical test. In his first tenure-track position, he says he's right where he wants to be. "Five years at Rice convinced me that this was the best job in the world," he says. "It's not only the teaching, but also the ability to work with smart people, continuously challenging my own intuition and my own work." How exactly do we learn? That question-immeasurably important at an institution of higher learning-is of special interest to new School of Education assistant professor Emily Peterson. Her research focuses on adolescents, and at AU she's teaching many future teachers who will be guiding those young minds. "There's a science of teaching, so we can understand good pedagogy. But then there's the science of learning," she says. "My research is about trying to understand what motivates people." Peterson initially had an altogether different career plan. Since her mom was a teacher, she resisted the education world. A tuba player, she started out as a music major at Towson University with the goal of becoming a professional musician. But then she added a second major in psychology, as she became fascinated by cognition and the brain. Even playing the tuba contributed to her curiosity about educational development. "I was practicing the tuba four to six hours a day. So, you're sitting in a room by yourself, trying to play. You have one hour of instruction with your teacher, and then you basically are supposed to be working about four hours a day for the rest of the week," she explains. "And I think that gave me a lot of time to think about how I was learning." She eventually earned her PhD at the University of Maryland, and she recently did a post-doc at Georgetown University in collaboration with James Madison University. Peterson has also explored spatial learning and gender inequity. In a video game such as Tetris, boys tend to outperform girls-partly for environmental reasons. "It's related a bit to the play experiences that you've had as kids. Boys tend to play with more spatial activities-things like blocks, Legos, puzzles-than girls," she notes. Other researchers have found that parents use more spatial language when talking to their sons, she adds. Tackling these kinds of challenges is part of the reason she joined AU's School of Education. "The School of Ed, for me, was really kind of unique in its dedication and mission toward advancing educational equity." Ibram Kendi has a joint appointment with the College of Arts and Sciences and the School of International Service. To learn more about Professor Kendi, click here and here. Brian Anderson is a new assistant professor of physics. He's been a Joint Quantum Institute post-doc fellow at the University of Maryland. Valentina Aquila, a new assistant professor of environmental science, was an associate research scientist at Johns Hopkins University. She had a joint appointment at NASA Goddard Space Flight Center. Silvina Guidoni, assistant professor of physics, also worked for NASA's Goddard Space Flight Center. Orisanmi Burton, assistant professor of anthropology, has a PhD in sociocultural anthropology from the University of North Carolina at Chapel Hill. Nika Elder is an assistant professor of art. She's focused on American art, including African-American art and the history of photography, from the colonial period to the present. Asia Ferrin is an assistant professor of philosophy and religion. Ferrin's interests include feminist philosophy and moral psychology. Sociology Professor Deanna Kerrigan will be the director of the Center on Health, Risk, and Society. Kerrigan has been co-director of the Prevention Core of the Johns Hopkins Center for AIDS Research. Manissa Maharawal, assistant professor in the Anthropology Department, has studied social movements such as Occupy Wall Street and Black Lives Matter. Patricia Park, a new assistant professor of literature, published her debut novel Re Jane in 2015. Dolen Perkins-Valdez was previously a visiting professor at AU and is now an assistant literature professor. She's written the novels Wench and Balm. Alexander Zestos is an assistant professor of chemistry. Zestos earned his PhD from the University of Virginia. Assistant Professor Marcelo Bohrt has research interests in race and ethnicity, international development, and Latin America. Anthony Fontes, now an assistant professor, was a Guggenheim Research Fellow and a post-doc fellow at University of Wisconsin-Madison. Joshua Rovner, associate professor, earned a PhD from MIT and has focused on intelligence and security strategy. David Barker, professor of government, is the new director of the Center for Congressional and Presidential Studies. Jeff Gill is a distinguished professor of government with a joint appointment in CAS's Mathematics and Statistics Department. An alum, he earned his PhD in public administration from AU. Amanda Click is an assistant librarian. She's interested in the globalization of higher education, academic integrity, information literacy, and international librarianship. Khelani Clay is an assistant law librarian. Clay earned a JD from AU. *These professors were hired last year but started this year. **Professors who will start in fall 2018.